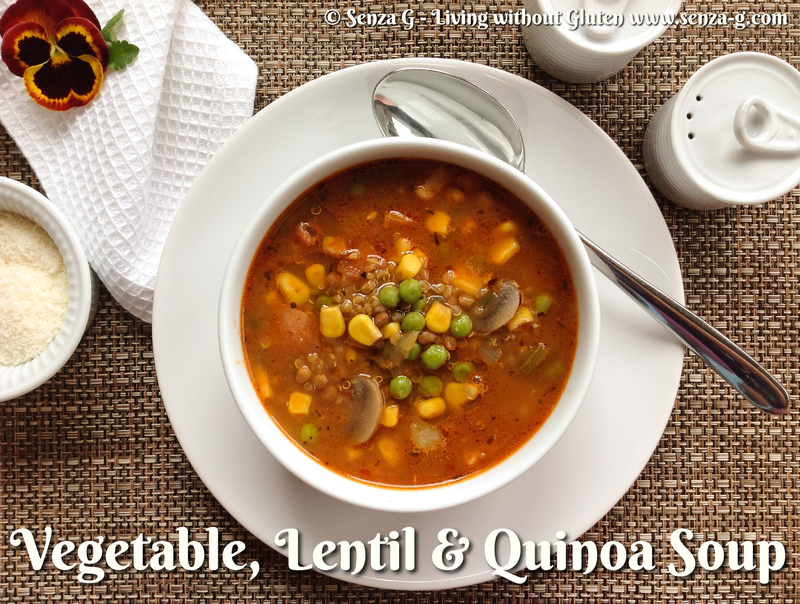 A home-made vegetable and quinoa soup, that is easy and very healthy too, making it a tasty and satisfying meal. Quinoa is loaded with protein, fibre and minerals and tastes real good in this soup! It is totally gluten free and this soup can easily be made vegetarian if you omit the pancetta. This soup also makes great leftovers … it actually tastes better the next day! Sauté the onion, celery, carrot and garlic in a little olive oil in a large pot over medium heat for about 4-5 minutes. Add the potatoes and pancetta and cook for another minute. Add the mushrooms. Next pour in the wine, stirring it in the vegetables, followed by the tomato paste and paprika, then the stock* and tied herbs. Bring to a boil. Reduce to a simmer and allow to cook for about 10 minutes, and then add the rinsed quinoa and lentils, and cook for another 20 minutes until tender. Add the sweetcorn and frozen peas, and leave over low heat until everything is heated through. Season with salt & pepper. Stir in some freshly chopped parsley. When you’re ready to serve, remove the tied sprigs of herbs (if you used fresh), and serve in bowls with a drizzle of olive oil and grated Parmesan if desired.